I made this anniversary card for my parents using the Waltzing Mouse Challenge Sketch this week. I used a Cuttlebug frame and then inked the raised portion with Distressed Antique Linen from Tim Holtz. Then smudged around the card with ink. 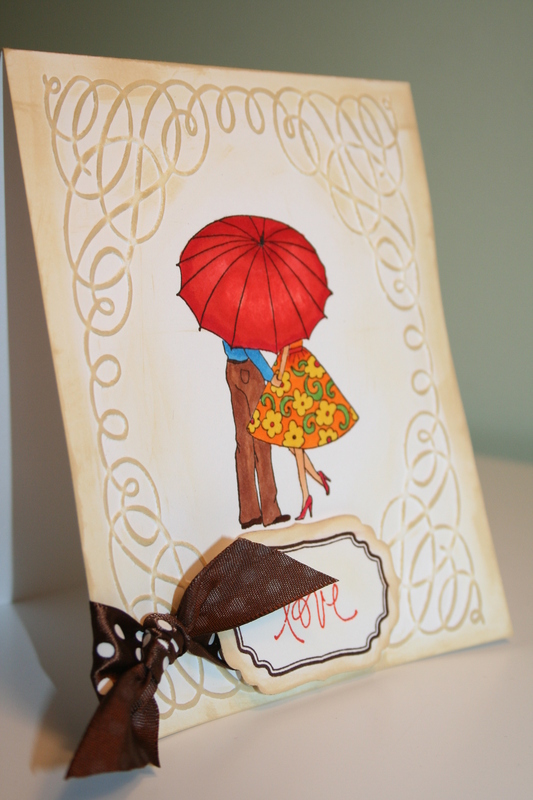 Next, I stamped the couple (American Art) in the center frame with Stampin Up Chocolate Chip ink. Then colored it in with my Copics. For the tag, I stamped Love (Unity) followed by my Waltzing Mouse Vintage tag #4 outline. Using my coordinating Nestie I cut it out and inked it up with the antique linen and popped it up over the ribbon. Pretty simple. Thanks for your kind comments, I love reading them!